Every exhibition is busy, so we work with our clients to make their display stand out. 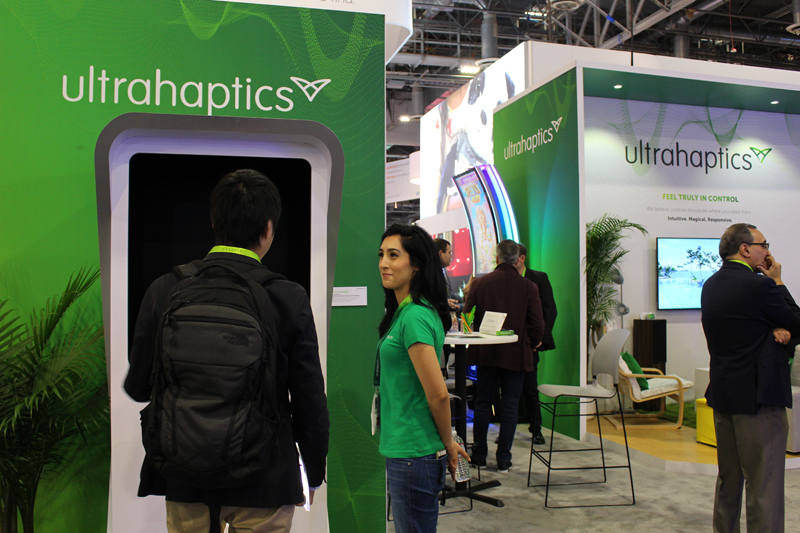 In this Business Leader article, Heather Mcdonald Tait from Ultrahaptics highlights the importance of being original with your ideas, with some great photos of the Ultrahaptics exhibition stand at CES, with the ATM kiosk designed by Crux and built by us here at Amalgam clearly attracting attention. The advances in virtual reality and computer-controlled electronics make the possibilities endless for interactivity – to create new ideas to inspire your audience and get them talking. How best to engage the audience with the physical product – so they spot it and can crowd round it. Once the design is ready, we can turn around a build project quickly to ensure it arrives on time for the show. 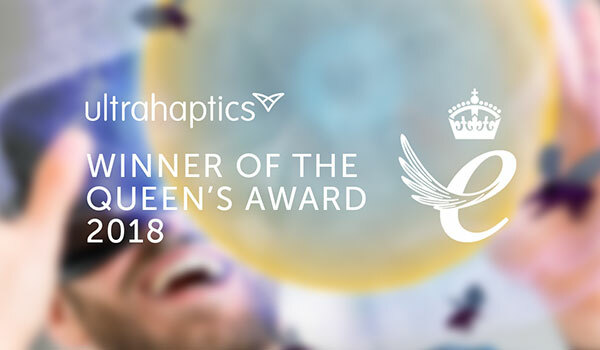 The Ultrahaptics exhibition is a prime example of how we work together with innovative companies. Good to see the exhibition visitors enjoying exhibition stands and interactives. 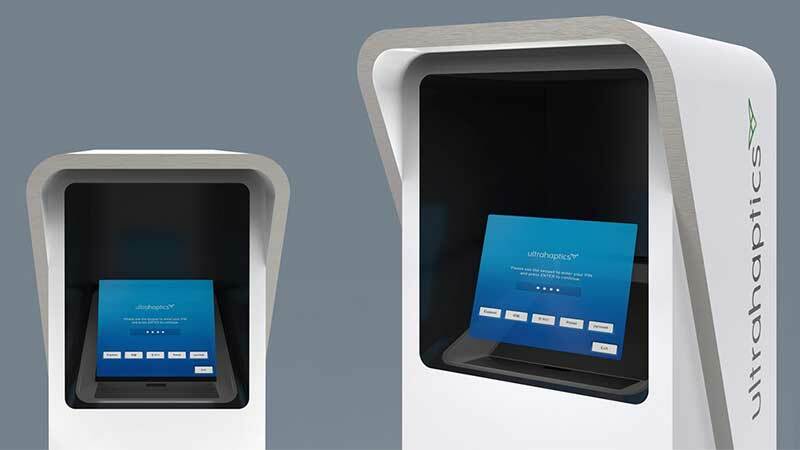 For CES, Crux Product Design came to us with their design for the Ultrahaptics exhibition kiosk to explore materials and ways to construct it. The challenge was to deliver the design and build both on time and within budget, so they sought our help to realise the booth. The kiosk looks like a traditional ATM unit, but there’s no keypad. It’s programmed to showcase the Ultrahaptics touch technology using a holographic screen from their Japanese partners, Asukanet. So when you walk up to it, the screen appears to be floating, asking you to enter your PIN. As you touch the holographic keypad, you receive haptic feedback from the numbers. Even more amazing, the ASKA3D glass technology acts as a privacy screen because you can only see it when looking straight on. Once Crux and Ultrahaptics signed off the final CAD, we used CNC machining to build the full-size booth. It allowed us to cut smooth, curved 2D parts, to construct the body of the unit. Fewer parts help to increase the strength of the kiosk ready for transport. To house the haptic technology, we created specialist casing by 3D printing the critical parts. Crux supplied the electronics and graphic design for the outer skin, working closely with us throughout the build. When we finished the kiosk shell, Ultrahaptics came on-site to Amalgam’s workshop to install their technology. To prepare for the trade show, it was essential to run consumer testing while the booths were still in Bristol, so we hosted small groups to try out each of the units. We love to see our projects in action – so accomodating our customers’ needs – including crates for transport and shipping – is all part of the service. If you need help to bring your next exhibition stand to life, call us on 0117 924 9596 or click the link. See the CES 2018 feedback. Congratulations guys! Great news, well deserved. Read more.